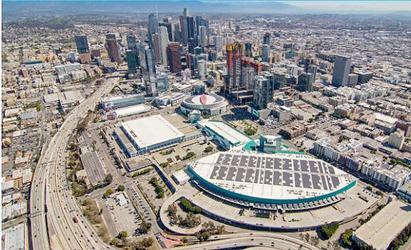 LOS ANGELES, California, April 11, 2018 (ENS) – The Los Angeles Convention Center, managed by AEG Facilities, has plugged in its new 2.21 megawatt solar array, making the City of Los Angeles number one for the most installed solar power of any U.S. city. Mayor Garcetti announced that Los Angeles has the most installed solar power of any city in America after a 44 percent increase over the past year, according to a new report by the Environment California Research & Policy Center. The report, “Shining Cities 2018: How Smart Local Policies Are Expanding Solar Power in America,” shows that Los Angeles now has 349.3 total megawatts of installed local power. That’s enough to power 82,500 homes in Los Angeles and save 187,304 metric tons of greenhouse gas emissions – the equivalent of taking 40,108 cars off the road. This rapid progress brings the city closer to meeting several goals outlined in Mayor Garcetti’s Sustainable City pLAn, including a clean and resilient energy supply through the expansion of local solar resources. “The Shining Cities No. 1 ranking is a testament to the Mayor’s leadership and to the strong interest among the city’s residents and businesses to do their part to achieve a clean power future for Los Angeles,” said David Wright, general manager of the Los Angeles Department of Water and Power. “The impressive growth of local solar is also a reflection of the improvements we’ve made to streamline all aspects of the solar programs, making it much easier for customers to go solar and generally improving our responsiveness to customers overall,” Wright said. The growth in solar capacity is fueled by two incentive programs and a streamlined permitting process, making it attractive and accessible for Angelenos and local businesses to install solar. The programs have helped provide more than 32,000 residential and commercial customers with $314 million in solar power incentives. Located on the roof of the Los Angeles Convention Center’s South Hall, the solar addition is the largest solar array on a municipally owned convention center in the United States. It brings the convention center’s total solar power to 2.58 megawatts. The new array is projected to generate 3.4 million kilowatt hours a year, which equates to 17 percent of the Convention Center’s annual energy usage – equal to enough electricity to power 565 homes in Los Angeles. The solar power generated by the new array will reduce the Convention Center’s carbon footprint by 2,554 metric tons per year. That’s equal to removing 2,794,396 pounds of coal from being burned or planting 66,192 trees. 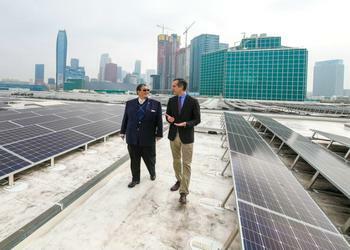 “I am proud to celebrate the completion of the Convention Center’s solar project,” said Jon Vein, who chairs the City of Los Angeles Department of Convention and Tourism Development Commission. “This project has set a precedent for other facilities to follow and is key to keeping Los Angeles the number one solar city in America,” said Vein. The Los Angeles Convention Center hosts conventions, trade shows, and exhibitions. Owned by the City of Los Angeles and professionally managed by AEG Facilities, the facility attracts over 2.5 million visitors annually. The facility is an integral economic component to the Southern California area, generating economic benefits through attendee direct and indirect spending and sustaining over 12,500 local jobs. The LACC also remains an enduring symbol of environmental sustainability and social responsibility, and is proud to be a LEED® Gold certified facility; the venue was recertified on the Gold level in 2015 making the LACC the first convention center of its size in the United States to receive LEED® EB:O+M Gold recertification. The project contributes to the mission of Los Angeles Mayor Eric Garcetti’s Sustainable City pLAn and AEG 1EARTH, AEG’s sustainability program, established to reduce the company’s environmental impact. Solar power is expanding rapidly. The United States now has over 53 gigawatts of solar photovoltaic capacity installed – enough to power 10.1 million homes and 26 times as much capacity as was installed at the end of 2010.